Project Giant Operation was a project in Winter 2009 in collaboration with Make:Philly. The Franklin Institute asked our two groups to design and build a *giant* game of operation for a Body Worlds 2 related event they were holding. Over the course of 4 weekends and 2 week nights we designed, built, and painted a giant version of the game Operation. The top of the board is 4x 8 sheet of plywood which is raised off of the ground, and beneath the board is the electronics and innards of the game. We fabricated a giant pair of tongs to use as tweezers, as well as a light up nose and buzzer that rings when someone touches the sides of the board. The first date for the 'Operation Playoff' was snowed out. The event was delayed until January 2010, when about 20 teams played on standard Operation boards at 'Ben Franklin's Feet' for the chance a the final playoff round on our giant version of the game. The Giant Operation board is currently housed at The Franklin Institute, where it is used for educational programs and events. Tango Echo 'zines coverage of the build. 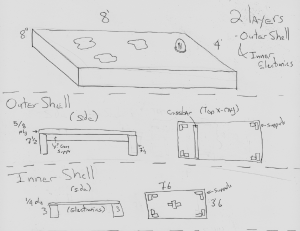 Here are some sketches of what our design is 1) An outer weight bearing shell, made by 1x? a 4x8 sheet of 5/8 plywood. 2) An inner components platform containing electronics, wells for parts to go into, etc. To make building fast, we have some 3 teams to work on this, based on the exampleat this instructable. --this team is responsible for foraging or making fake organs to go inside the body. The organs can be made through any means, such as foam construction, cardboard cutouts, 3-d printing, sculpy clay, whittling, beef jerky laser-beaming, others...? Also, donations of weird junky objects are very welcome. Metal (ie conductive) objects even more so. This page was last modified on 17 January 2012, at 18:00.